Christmas might be over, but the good news is the January sales are here -- and in cruise talk that means the wave season, which typically runs from now until March. It provides cruise lovers with the chance to grab a seagoing or river cruise bargain, or bag added extras, such as drinks packages, onboard credit, buy-one-get-one-free fares and more. We've rounded up some of the best deals on offer. ; Keep checking back, as we'll be updating the list as more come in. What it is: All passengers booking a Fantastica Experience fare in any cabin category get an all-inclusive drinks package on all summer 2018 and winter 2018/19 fly-cruise and cruise-only holidays. Eligible voyages include: 14-night Caribbean cruise on the new MSC Seaside departing April 14, 2018; 11-night half term Southampton European round-trip cruise; seven-night Mediterranean cruise departing Venice August 24, 2018. What it is: Buy-one-get-one-half-price cruises fares with all-inclusive Deluxe Beverage drinks package for first and second passengers on selected sailings, plus 25 percent off and free Refreshment Package for third and fourth passengers. Eligible voyages include: seven-night Eastern Caribbean round-trip cruise from Fort Lauderdale, departing April 29, 2018; seven-night Northern European round-trip cruise from Southampton, departing May 27, 2018; seven-night Norwegian fjords round-trip cruise from Southampton, departing July 28, 2018. What it is: Complimentary all-inclusive dining drinks upgrade or up to £200 per passenger to spend on shore excursions. Eligible voyages include: More than 100 sailings, including a 15-night adults-only Madeira & Canary Islands cruise departing Dover April 13, 2018; 16-night Mediterranean & Monaco Grand Prix cruise departing Liverpool May 18, 2018; Norwegian fjords cruise departing Edinburgh June 23, 2018. What it is: Free gratuities on sailings from Southampton. 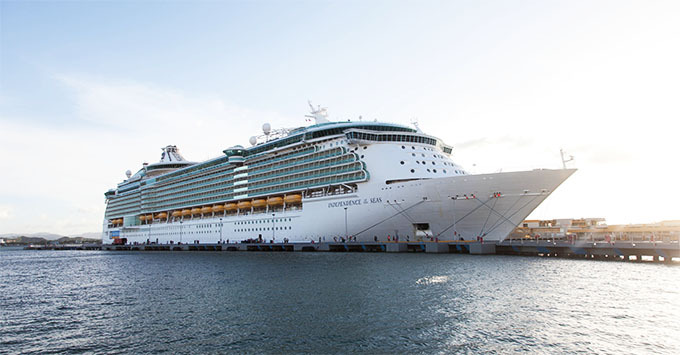 Eligible voyages include: Selected sailings, including cruises on newly refurbished Independence of the Seas. What it is: Second passenger pays 50 percent of fare -- savings of up to £2,500 per couple -- and free Wi-Fi is included. What it is: Savings of 10 percent per passenger and free round-trip business class flight upgrades. Eligible voyages include: nine-night Northern Europe cruise departing Stockholm August 31, 2018; nine-night Mediterranean cruise departing Venice September 28, 2018. What it is: Complimentary onboard spend of up to £620 per cabin on all Select Price bookings on cruises less than 35 nights. Eligible voyages include: eight-night Mediterranean round-trip Malta cruise, departing May 10, 2018; 30-night Canada & New England cruise, departing September 3, 2018; 14-night Caribbean transatlantic crossing, departing October 19, 2018; seven-night Baltic cruise, departing December 10, 2018; 10-night Arabian Gulf cruise, departing Dubai January 31, 2019. What it is: Second passenger pays half price, and both receive a complimentary Classic Drinks Package (worth $55 per day) on cruises from Alaska to Australia and from the Mediterranean to the Middle East. Eligible voyages include: 11-night Western Mediterranean cruise, round-trip from Rome, departing May 28, 2018; 14-night Scandinavia & Russia summer solstice cruise, round-trip from Southampton, departing June 9, 2018; 10-night Greek Isles cruise, round-trip from Venice, departing August 20, 2018. What it is: Savings on more than 800 cruises and only a 5 percent deposit required to secure booking. Eligible voyages include: seven-night Spain and France cruise, round-trip from Southampton, departing May 5, 2018; 14-night Western Mediterranean & Aegean cruise, departing Athens June 2, 2018. What it is: £100 off summer and winter 2018 sailings. Eligible voyages include: 18 cruises departing between May 1, 2018, and April 30, 2019. What it is: Complimentary upgrades, up to £375 onboard credit per stateroom and £375 air credit per person. Eligible voyages include: Selected worldwide sailings, including new Seabourn Ovation launching May 5, 2018. What it is: Deals on seven European sailings with six-night sailings from £995. Eligible voyages include: 10-night Greece & Dalmatian coast cruise departing May 8, 2018; 12-night Italy & Adriatic cruise departing May 18, 2018; 13-night European Connoisseur itinerary departing June 10, 2018; 6-night Harbours & Gardens sailing departing June 17, 2018. What it is: An £800 savings based on two people sharing a balcony cabin. Eligible voyages include: 14-night southern Caribbean roundtrip Miami cruise departing February 18, 2018. What it is: One-category suite upgrade and $1,000 onboard credit per cabin. Eligible voyages include: Eight-night Manila to Singapore cruise departing April 5, 2018. What it is: Save up to 10 percent on earlybird bookings on the new Scenic Eclipse discovery yacht, plus an additional discount of £250 per person on balances paid by March 30, 2018. Eligible voyages include: Selected sailings from September 2018 to July 2019. What it is: Save up to 30 percent on cruise prices, and flights or Eurostar from the UK included. Eligible voyages include: nine-day Tulips & Windmills itinerary departing March 22, 2018; seven-night Rhine cruises departing April to November 2018; seven-night Danube cruises departing March to November 2018. What it is: Book a lead-in category cabin on an A-Rosa cruise, and get a free upgrade to the best available cabin at time of booking. Eligible voyages include: three-night Dutch cruise departing September 15, 2018; seven-night Holland & Flanders cruise departing September 15, 2018; five-night Flanders cruise departing September 18, 2018. What it is: Save up to £4,600 per couple on European cruises and £1,200 per couple -- plus free flights -- on Asia itineraries. Eligible voyages include: Selected 15-day Magnificent Amsterdam to Budapest itineraries, as well as China, India, Myanmar, and Vietnam and Cambodia tours. What it is: A £99 per person deposit on Active Discovery Rhine sailing, including cycling, running and hiking excursions. Eligible voyages include: Seven-night Frankfurt-to-Amsterdam cruise departing July 15, 2018. What it is: Up to 40 percent off cruises and complimentary private door-to-door chauffeur transfers. Eligible voyages include: All 2018 Europe river cruises. 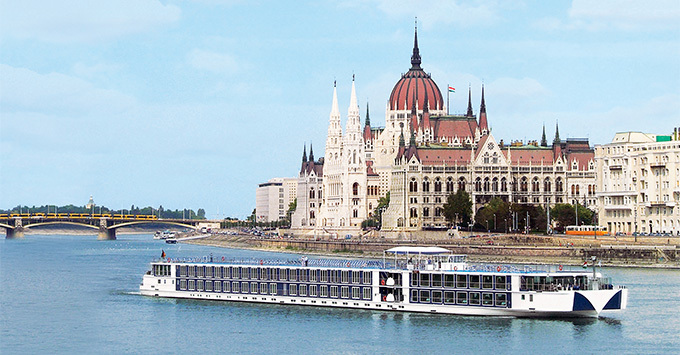 What it is: Save up to £700 per person on Danube Delights itinerary. Eligible voyages include: Seven-night sailing departing December 8, 2018. What it is: Save up to £1,200 per person on a food- and wine-themed cruise. Eligible voyages include: Bordeaux roundtrip cruise departing April 21, 2018. What it is: Savings of up to £800 per person on selected 2018 Brahmaputra River cruises. Eligible voyages include: Nine-night cruise departing Kolkata March 1, 2018. What it is: Complimentary business-class flight upgrade and return chauffeur airport transfers. Eligible voyages include: Selected river cruise and escorted tour itineraries to southeast Asia. What it is: Save up to £1,000 per person with an extra £200 per-person discount when booking a balcony suite. Eligible voyages include: Selected European sailings in 2018. What it is: Savings of £1,000 per passenger on 2019 river cruises. Eligible voyages include: Destinations across Europe, Egypt, China and Russia. What it is: Up to 20 percent off cabins and full boat charters. Eligible voyages include: Selected French sailings in April 2018. What it is: No single supplements on hotel barge cruises, offering savings of up to £1,650 for solo travellers. Eligible voyages include: Selected sailings in France, Holland and Italy in 2018.